The hardest part of coming up with this cocktail was naming it. It's inspired by PDT's Betula, substituting summery Italian Aperol for the Betula's rum. Geographically it's all over the place. The core ingredient is whiskey, specifically Corsair's Triple Smoke American Single Malt Whiskey. It has a distinctive smoky aftertaste. The sweetener is maple syrup, heralding from New England. 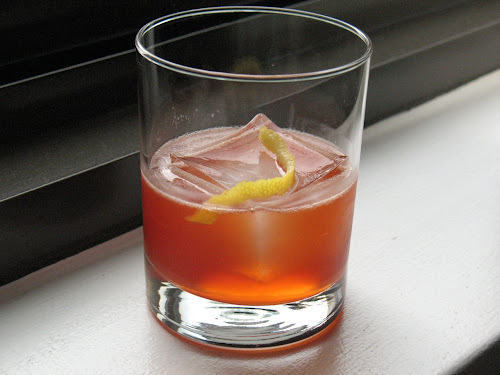 My main idea was to do something that signifies the end of summer, with the Aperol and lemon looking back to cold drinks on a warm evening, and the whiskey and maple syrup looking ahead to the coming cold months. If all that backstory makes me sound like a blubbering Project Runway contestant trying to explain a haphazard design to the judges, fear not. This isn't a haphazard drink. It's rather good, I promise! Combine liquid ingredients in a shaker with ice. Shake well until cold and strain into lowball with ice. Serve with lemon twist. 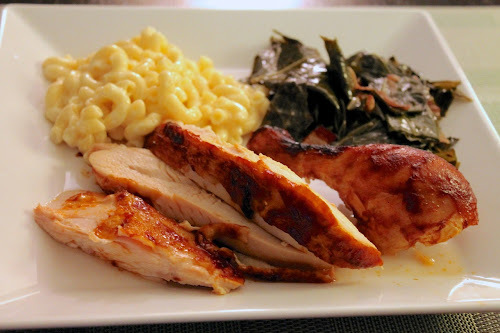 Along with the Collard Greens with Bacon, this Smoky Mac & Cheese was the other side I served with Smoke-Brined Oven BBQ Chicken. This is the just the Modernist Mac & Cheese but made with different cheeses: a combination of smoked gouda an smoked mozzarella. Credit for the cheese combination goes to Washington Post Food Editor Joe Yonan, who suggested the combination to me during a recent Free Range on Food chat. 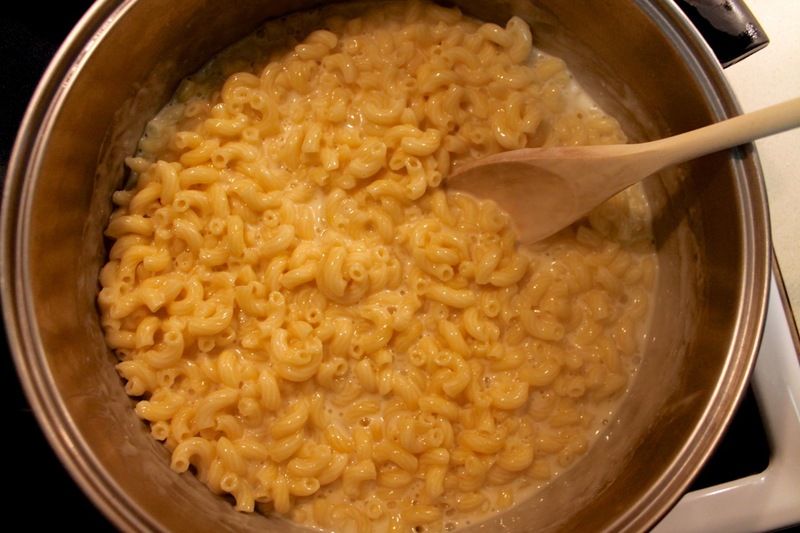 Since the Modernist Cuisine recipe for Mac & Cheese has no other ingredients--apart from the sodium citrate and water--it has an intense cheese flavor. And the sodium citrate gives it an amazingly pure texture. I've made a Smoky Mac & Cheese before with chicken, but this version is both simpler and more intense. The only catch is finding sodium citrate, but Amazon makes that a snap. Of course, you could always go the traditional route with a bechamel-based cheese sauce. To finely grate the cheeses, I cut them into 1/2-inch cubes and them pulse the cubes a few times in a food processor until the cheese has a sandy texture. 1. Cook macaroni in salted water according to package directions for al dente. Drain cooked pasta and set aside. 2. Add 2 1/4 cups water to a large (4 qt.) saucepan and heat over medium heat until simmering. Add sodium citrate and stir to dissolve. Add grated cheese to water one spoonful at a time. 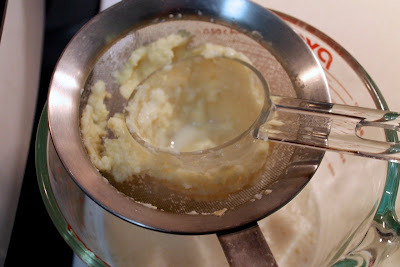 After each addition, blend with an immersion blender until the mixture is smooth. 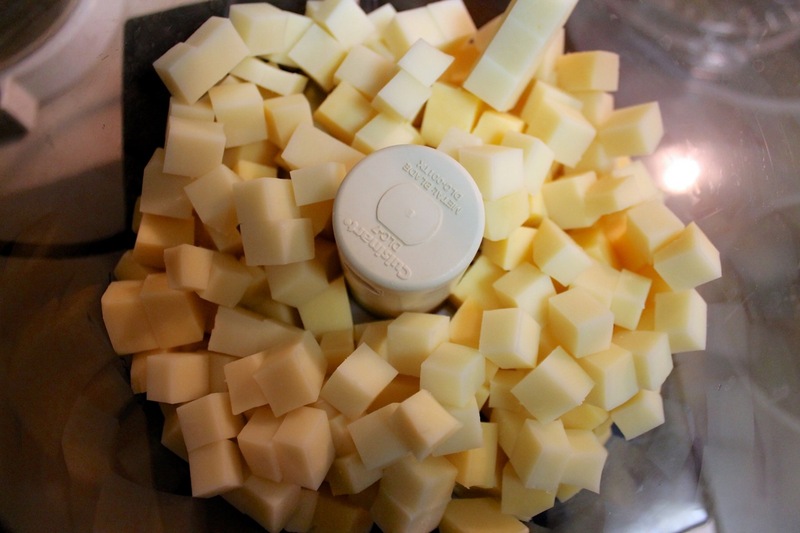 Continue in this manner until all the cheese has been added and melted in the sauce. 3. Pour the sauce over the cooked noodles and stir to combine. New York Times: “Building a Better Mass-Market Tomato," by Kenneth Chang. It’s pretty clear at this point that supermarket tomatoes are basically worthless: tasteless, mushy, ghostly looking replicas of real tomatoes you can grow yourself or buy locally grown from farmers markets. The tomatoes at the store have been bred to look pretty and ship well, to the determent of taste and nutrients. One University of Florida researcher is trying to change that though and bring back flavor to the grocery store tomato. A noble enterprise for sure--I hope he’s successful. Bon Appétit: “Why Sherry Is Suddenly Cool,” by David Lynch. For a long time, people had sherry in their fridge for those times when Chinese stir-fry recipes called for a splash. No one was actually drinking the stuff. Times have changed though, and drinking sherry is back in vogue. This article includes a handy guide to some common styles and even a delicious-sounding sherry cocktail with Aperol, honey and citrus courtesy of Portland’s Ava Gene’s restaurant. The Roaming Gastronome: “Apple Onion Chutney and Canning for the First Time,” by Jason Andros. I’ve never tried canning anything for long-term storage. And although I’m convinced I’m not up to trying it (for lack of storage space), that won’t dissuade me from making a small batch of The Roaming Gastronome’s amazing-sounding Apple Onion Chutney. Sounds like such a great combo that would be good with lots of meats—particularly chicken or pork chops—or slathered on whole grain bread, perhaps with a spread of some soft brie. Mmm… For those who would like to try canning it, Andros includes links for how to do that successfully. Huffington Post: “Seeking Longevity? Eat Real Food,” by Andy Bellatti. Bellatti, a dietician and author of Small Bites, points out how stories espousing the longevity of certain pockets of native cultures often peg their health on the consumption of a particular food, while ignoring the (possibly) more likely culprit: the absence of industrialized food products. He also offers five rather sensible suggestions for healthy eating. The Guardian: “The brightest bulb: Hugh Fearnley-Whittingstall's garlic recipes,” by Hugh Fearnley-Whittingstall. Who doesn’t love garlic? I certainly do—we go through a head every week or two. Fearnley-Whittingstall shares some great tips for cooking with garlic: when it’s better crushed vs. sliced, for example. He shares some great garlic recipes too. Hunger Angler Gardener Cook: “Poached Salmon with Dill-Horseradish Cream,” by Hank Shaw. Shaw’s salmon dishes always look really good and this is no exception: a butter-poached salmon fillet with a simple dill cream sauce spiked with horseradish. Sounds delicious! Annarasa - Essence of Food: “Lemon Quinoa / Lemony Quinoa Pilaf,” by Apu. Inspired by south Indian-style lemon rice, Annarasa has concocted this delicious and fairly simple sounding recipe with quinoa. The only challenge might be acquiring some of the ingredients, but I bet you could make a few substitutions and still have a great dish. If you like vegetarian and vegan recipes, her site has quite a few great ones. CNN: “Oreos high school experiment: Double and Mega Stuf filling doesn't add up,” by Michaela Perreira and Ed Payne. A high school science class experiment revealed that “Double Stuf” Oreos don’t actually contain twice as much filling as the regular ones, but rather 1.86 times. I wasn’t surprised to find Double Stuf Oreos don’t have exactly twice the filling, but apparently Oreo was, who insisted the recipe does include double the filling. I think the class should next tackle exactly what’s in the Oreo “cream” filling (hint: it’s not a dairy product). NPR: “Julia Child Was Wrong: Don't Wash Your Raw Chicken, Folks,” by Maria Godoy. Think washing your chicken before cooking it is safe? Think again. According to Godoy’s story, the practice will do more to spread germs in your kitchen than it will to disinfect the chicken (which gets properly disinfected by cooking it at a high enough temperature). I love the “germ-vision” video, which shows a home cook rinsing her chicken and spreading germs all over her kitchen. Yikes! Washington City Paper: “Against Rum Day. And National Watermelon Day. And National Crème Brûlée Day. 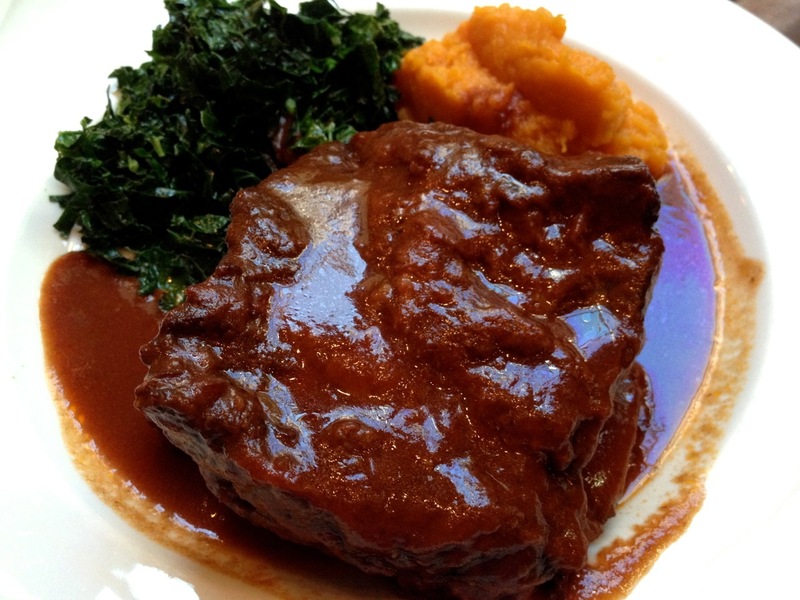 And National Filet Mignon Day,” by Jessica Sidman. CNN Eatocracy: “Sommelier turns water into cash,” by Dantel Hood. A water sommelier? It may sound like The Emperor’s New Clothes, but It exists. 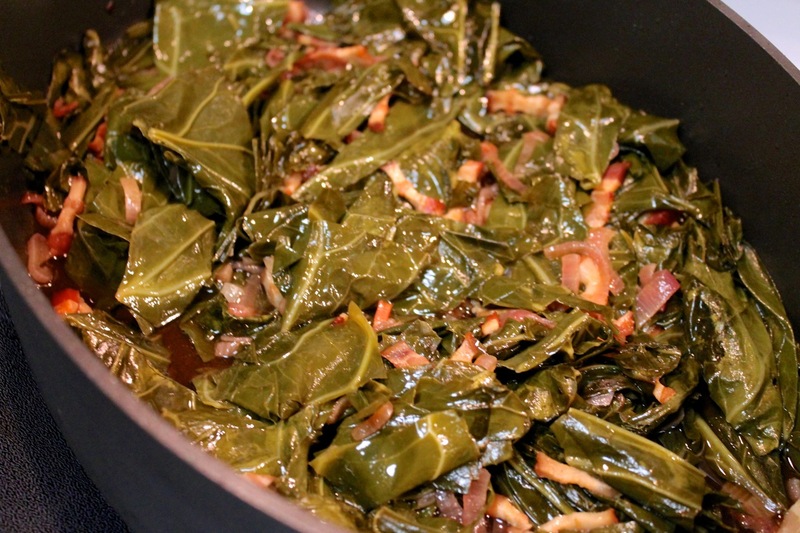 I made these Collard Greens with Bacon as one of the sides with my Smoke-Brined Oven BBQ Chicken I posted yesterday. I adapted this recipe from Martha Stewart. It's a simple and tasty side. If you use a good smoked bacon like I did, it will also have a nice smoky flavor. Whenever I want intensely flavored smoked bacon, I also head to Harvey's Market, the butcher shop in D.C.'s Union Market. Their thick hickory-smoked bacon is simply amazing. 1. Heat a large sauté pan over medium-high heat. Add bacon and cook, stirring frequently until browned and crispy, remove from pan with a slotted spoon and drain off all but about a tablespoon of bacon fat. 2. Add onion to pan and sauté until softened, about 5-6 minutes. 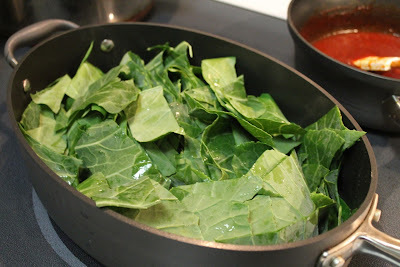 Add the greens and cook, stirring frequently, until wilted and reduced in volume. Return cooked bacon to pan and add vinegar, stirring as it evaporates. Add water, cover pan and reduce heat to low. Simmer, covered, for about 12-14 minutes until the greens are tender. Barbecue, chipotle, mezcal...anything smoky and I'm there. It's a challenge though, as an urban apartment dweller, to get smoky flavors into my food, since where we live we're not allowed a grill. With Labor Day coming up to signal the unofficial "close" of summer, I wanted to prepare a traditional barbecue meal made indoors that came as close as possible to satisfying my cravings for the outdoor experience. An easy way to get smoke into your food is to include smoked ingredients. The collard greens recipe I'll post later this week gets its smoky flavor from hickory-smoked bacon from Harvey's Market, which has become my hands-down favorite bacon in D.C. Likewise, the smoky mac & cheese I'll also share with you gets its smoky flavor from a combination of smoked cheeses. Seasonings are another good way to go: chipotle chili powder if you want a fiery kick with your smoke; smoked paprika if you don't. There's also smoked salts available, although I've not had a lot of luck with them. However, there are times when you don't necessary want smoked cheese or spices in your dish, but you still want smoke. That's when liquid smoke is a good option to turn to. Liquid smoke is real wood smoke that has been condensed to liquid form. I used Colgin Natural Hickory Liquid Smoke for this recipe. I've used it before in barbecue sauce and chili and it imparts true smoke flavor. Sometimes I'll add a dash to chicken while it's sautéing. Here I went a different route though: I decided to use it in a brine. 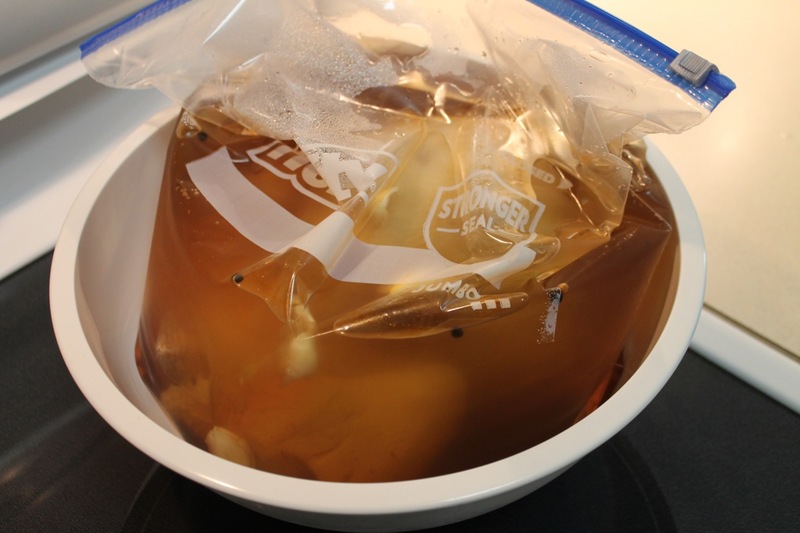 Brining is typically done to add moisture to meat--the presence of salt facilitates moisture transport from the brine solution into the meat. (For discussion on how brining works, see my Brined Roasted Turkey Breast; for another previous brined poultry recipe, see also Spice-Brined Roast Chicken a la Palena). 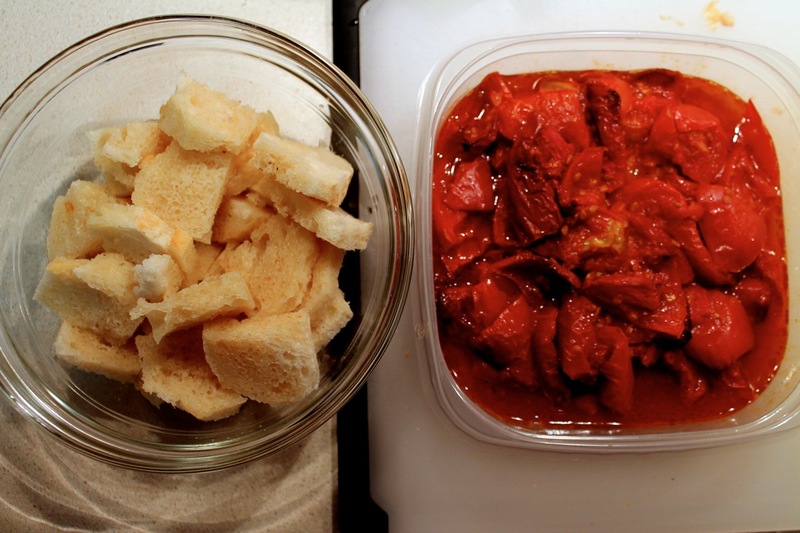 But you can also use the process to add flavor, since flavors in the brining liquid will be carried along into the meat. I've done it before with spices, so I decided to try it with liquid smoke. I used 3 tablespoons of liquid smoke, which may seem like a lot, since typically you only use a teaspoon or so in recipes. However, unlike in a sauce, you're not going to consume the brining liquid, so it's important to achieve an adequate concentration. Were I making this again, I might up the smoke to 1/4 cup, actually. The resulting chicken was delicious and subtly smoky. Yes, It lacks the smoky intensity of actual barbecue, but there's definitely a smoke element in the meat beyond just what would be in the barbecue sauce. It reminded me a bit of the roasted barbecue chicken I had earlier this year from Blue Duck Tavern. 1. Combine the 2 cups water, salt, sugar, syrup, mustard seed, peppercorn, chili powder and garlic in a medium saucepan over medium heat. Heat, stirring frequently, until the salt and sugar have dissolved. Remove from heat and stir in the liquid smoke. Allow mixture to cool (you may cool it faster by using ice--be sure to then reduce the 3 quarts of water in equal proportion). Transfer to a brining bag (I used a 2-gallon sealable freezer bag) and add the chicken and remaining 3 quarts of water. Refrigerate overnight--up to 24 hours--as the chicken brines. 2. Preheat oven to 450 F with oven rack in middle position. 3. Remove chicken from brine, rinse and pat dry. Place chicken on an oven-safe cooling rack set inside a sheet pan (alternatively, place the chicken in a roasting pan). Spray chicken all over with olive oil. Roast until the chicken starts to brown, about 20 minutes. 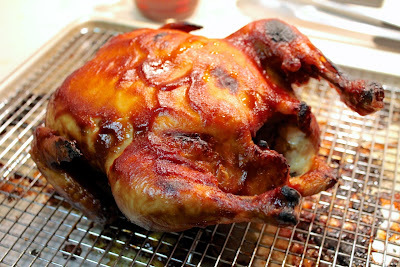 Reduce heat to 425 and continue roasting until the chicken reaches an internal temperature of 165 F. Remove from oven. 4. Turn on the oven broiler. Slather the chicken with barbecue sauce, then put back in the oven. The sauce will dry out and brown a bit--watch carefully to prevent burning. Remove when the sauce looks evenly dry and a little brown. Allow the chicken to cool slightly before carving. 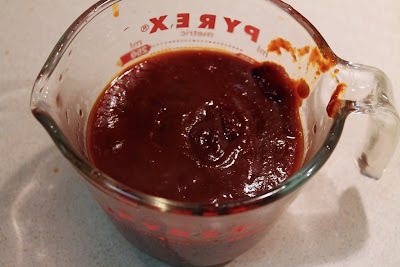 I liked this recipe because it's a pretty simple and traditional barbecue sauce. So that it would work better for coating the chicken, I made it thicker by adding tomato paste. I also added some liquid smoke flavor. Mix all ingredients together in a medium saucepan. 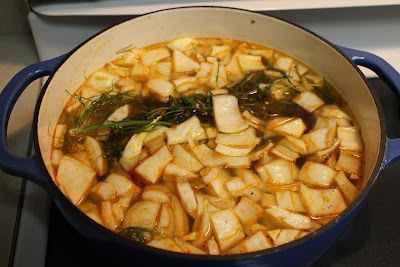 Bring to boil over medium heat, then reduce heat and simmer for 10-15 minutes until thickened. One of my closest friends got married recently. It was a beautiful affair in her fiancé's (now husband) parents' backyard in suburban Cleveland. There were lots of personal touches throughout the ceremony and reception, including one I was responsible for: the signature cocktail. Coming up with a cocktail for the wedding was a great honor and also a challenge: I had to create something somehow symbolic of the occasion and make it on a much larger scale than I'm used to. Generally, I make two drinks--one for Chris and one for me--or maybe four if we have guests. Something that could serve 100 people is a bit different. But "size matters not" as Yoda says, so dive in I did. Since it was an outdoor summer wedding, I thought a punch would be appropriate: something tart and refreshing in case it was really hot (as it was, the weather was about as perfect as possible). After consulting with the bride-to-be, I settled on a lemonade-based drink with ginger liqueur and mint. The spirit proved to be more challenging. Originally, I conceived this drink with rum, but I was never completely sold on it. After testing it also with vodka and gin, it was clear that gin was the best choice. The rum overpowered the other ingredients, while the vodka just kind of faded away. It was the gin that pulled it all together. There was a catch though: said bride has insisted in the past that she doesn't like gin--yet, I've served her several gin cocktails over the years and only tell her what's in them after she declares "mmm, this is good!" 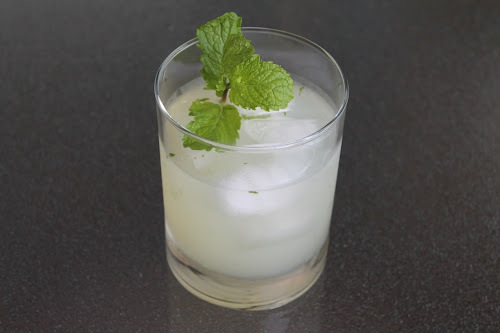 To make the drink on a large scale, we used a serving container with a spigot and an infuser for the mint. I mixed the drink in the kitchen, careful to scale up the proportions. In the end, the proof that it was a big hit was that it was "sold out" before cocktail hour was over, and even the bartender told me it was a good drink. For a food and cocktail blogger to bomb the signature cocktail at an event like that would have been a major disgrace. Whew. For this home version, I was able to add some additional symbolism with a mix of gins: Dry Fly from Washington state, where my friend and I met and attended college; Green Hat from Washington, D.C., where we've lived and been close friends (and, for awhile, roommates) for many years; and Aviation from Portland, Oregon, where I'm from and she (and her wonderful new husband) are now moving to. This recipe is enough to make two drinks. Since it's a wedding cocktail, it's meant to be shared with someone else. Oh, and the name? That's an inside joke between me and the bride. Maybe someday we'll share it with you. Add the mint leaves and ginger liqueur to a cocktail shaker and muddle. Add ice, gin and lemonade. Shake until well mixed and cold. Strain into a rocks glass with ice. Garnish with a mint sprig. I don't "crave" a lot of foods, but every once in awhile I really want a good tuna salad sandwich. 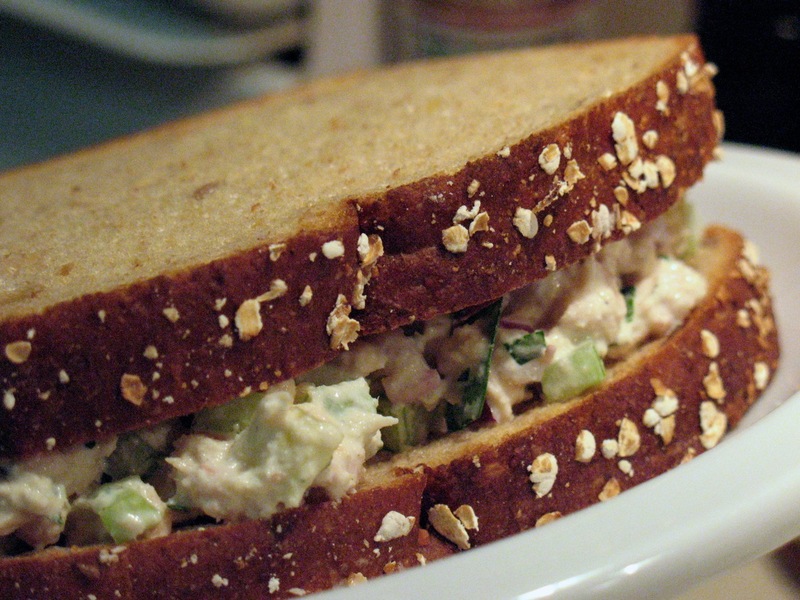 Bad tuna salad sandwiches are common. They often taste like something that was mixed up hours beforehand--or longer--without much thought to flavor other than mayonnaise. A good tuna salad should have a nice freshness to it: crunchy celery and scallions, a bright tang from lemon juice and a bit of zip from mustard or horseradish (or both). This recipe is a nice basic one, but you could mix it up in all sorts of ways. I could see a southwestern version with avocado and a little kick of chipotle. Or a Mediterranean version with olive oil, capers and roasted red pepper. Lots of possibilities here. 1. 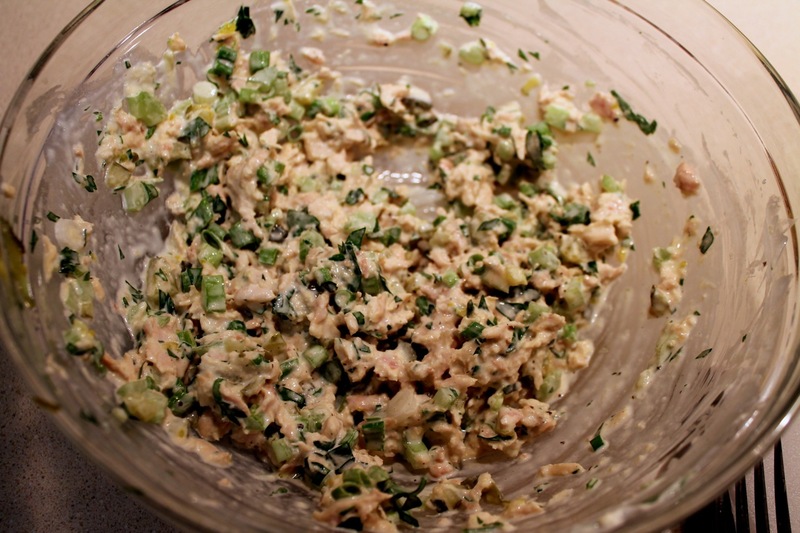 Drain any water from the tuna and add to a bowl. 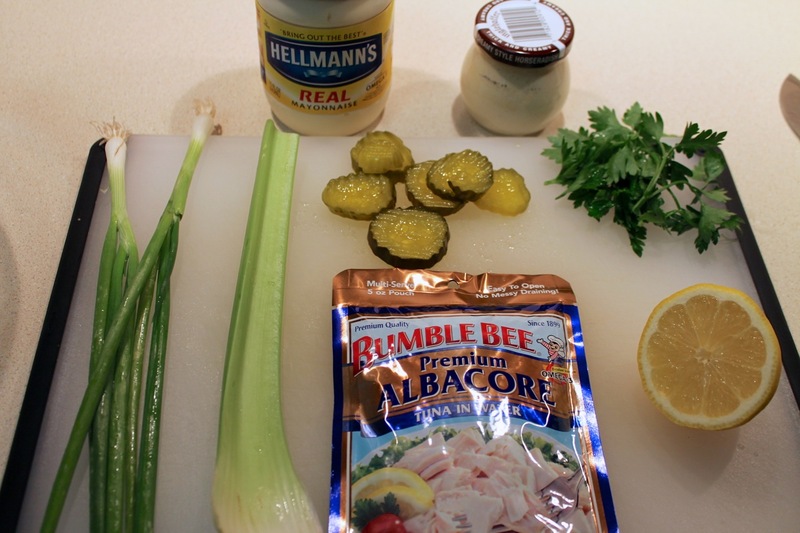 Stir in the mayonnaise, horseradish, lemon juice, parsley, pickles, celery, scallions, salt and pepper and mix with a fork until well combined. Serve on bread with tomato slices, lettuce and additional pickles, if desired. Buzzfeed: “The Notorious MSG’s Unlikely Formula For Success,” by John Mahoney. Umami, like "small-batch," "locavore" and "kale" is one of those terms that easily rolls off the tongues of foodies these days. If you’ve not heard of it, it’s the “new” fifth flavor, a sort of savory flavor created by the presence of glutamic acid to go along with the four longstanding flavors: sweet, bitter, sour and salty. Mohoney’s piece is long, but worth the read if you’re interested in a thorough and fascinating history of the development of the perhaps unfairly maligned umami seasoning ingredient, monosodium glutamate, and current chefs efforts to derive umami from new sources, particularly that of Momofuku’s David Chang. Associated Press: “Ready for anchovies to move into the mainstream?,” by Michele Kayal. Like a lot of people, for along time I thought of anchovies as the stinky little fish that you don’t want to accidentally appear on your pizza. Then, in the last few years, I’ve come around by learning how good-quality anchovies can enhance a dish with subtle meatiness. Kayal explores various ways chefs are using them, including D.C.’s Nick Stefanelli of Bibiana, and includes tips and ideas for using anchovies effectively. Washington Post: “Mega-chain restaurants do some things right,” by Tom Sietsema. By and large, the restaurants that Washington Post critic Tom Sietsema reviews are independent establishments—downtown places that generate buzz and occasional neighborhood favorites in other parts of the city. Rarely does he give much attention to national casual chain restaurants, and why would he? They are known quantities, virtually the same anywhere in the United States (I can tell you right now what an Olive Garden bread stick will taste like, no matter where I get it from and even though I haven’t eaten one in years). Here, he puts a focus on this important segment of the restaurant industry, discussing its efforts to remain current amid the expanding threat of the fast-casual segment. The food, alas, is often lacking, but Sietsema presents research that suggests that’s not necessarily what draws patrons to them anyway. U.S. News & World Report: “What Papa John's Doesn't Want You to Know About Its Food,” by Melanie Warner. Wanting more information behind Papa John’s claim that it boasts “better pizza; better ingredients,” Warner tried to get some details from the national pizza chain, and got the run-around, although she did get an interesting detail from an employee, who told her their supposedly “never frozen” pizza dough actually arrives frozen. The article has sparked quite a bit of debate, both from those who defend Papa Johns from these accusations and others concerned they may be true (check out this consumer law blog's post tagged "class-action investigation"). You may not think whether the pizza chain freezes its dough is such a big deal, but when big food companies make a claim about their product—especially a key claim like this—I think it’s important that it be truthful. Thrillist: “Red, White & Food: Mapping all 50 states' most significant chain restaurants,” by Matt Lynch. There’s something about maps that always manages to get me excited. I love Jasper Johns’ U.S. map especially. This Thrillist map represents each state with the logo for its most prominent fast food chain, making for a colorful statement about corporate American and food. CNN Eatocracy: “12 weird, wonderful cocktails worth seeking out,” by Tamara Hinson. If you think the infused whatchamacallit down at the corner hipster bar is weird, wait until you see some of these drinks. 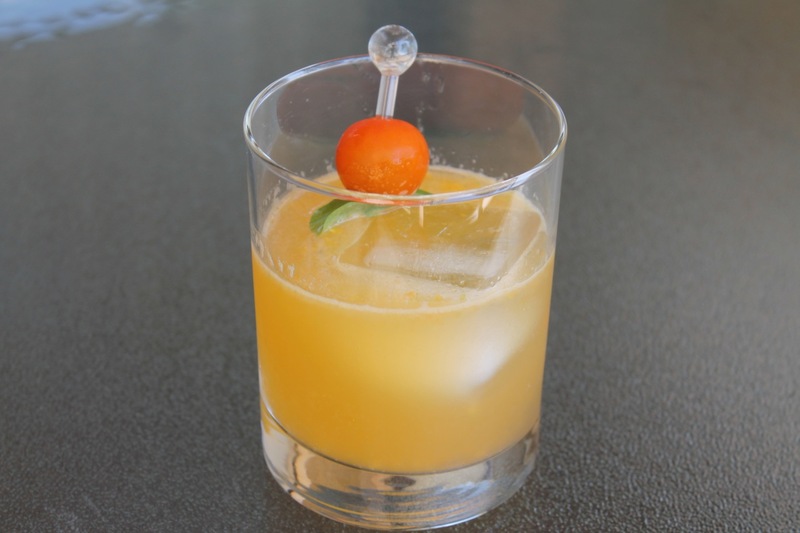 The strangest (and most foul) has to be the Sourtoe cocktail from The Yukon, which features, for real, a preserved human toe. Bottoms up! New York Times: “Dressing Up the Loaner Jacket,” by Helene Stapinski. Very few restaurants require men to come in jackets anymore. For the few that do, since diners might not be expecting that, they have loaners on hand. Stapinski examines some such fine dining establishments in New York and finds that they take quite a bit of pride in these jackets, many of which are custom-made. Popsci: “Is Hair In Food A Health Risk?,” by Victor Zapana. Zapana poses a rather excellent question, given how squeamish they can get over an errant follicle. It’s amazing the things some people will eat yet turn away in disgust if there’s something as benign as a human strand of hair on their plate. I won’t tell you the answer to the question, but he definitely explores the issue thoroughly. More and more I'm finding that pickles shouldn't be viewed as just an ignorable garnish. They can be quite tasty. I'm particularly fond of the pickles The Carving Room serves with sandwiches and salads. I also really like the pickle plate at DGS Delicatessen. But until recently, I'd never tried making my own. Cathy Barrow, writer of the Mrs. Wheelbarrrow's Kitchen blog and occasional contributor to both the Washington Post Food section and New York Times Dining section, recently wrote about making homemade sour pickles. It's surprisingly easy. The base recipe requires just three ingredients: pickling cucumbers, water and salt. After that, you're free to include (or not) other flavorings such as garlic, jalapeño, dill and coriander seeds. I'm sure other herbs and spices would be welcome. I chose to keep the pickles pretty simple with some fresh dill and coriander seed. Cathy recommends using filtered water if you're not sure whether your tap water is chlorinated, since chlorine inhibits the microbial process necessary to make the pickles. I did some research and discovered that D.C. tap water is, in fact, not chlorinated (except for a brief cleansing period in the spring). So I gave tap water a try and all worked out great. Sour pickles after 1 day (top left), 2 days (top right), 3 days (bottom left) and 4 days (bottom right). According to Barrow, it takes 3 days for the pickles to be ready. If you leave them out longer they'll be more sour, so you can go as long as 5 days if you prefer. I split the difference and refrigerated mine after 4 days, after which they'll keep in the fridge for a month. Nothing much happened after the first day, but after 2 days the brine was getting cloudy and little bubbles rose up if I gently shook the jar. I tasted the pickles after 3 days and decided they weren't sour enough, so I left them out one more day before refrigerating them to basically stop (or rather drastically slow) the fermentation process. These pickles are not the kind that will keep long term--for that, you have to apply a canning process to seal them, which is not something I've ever tried. 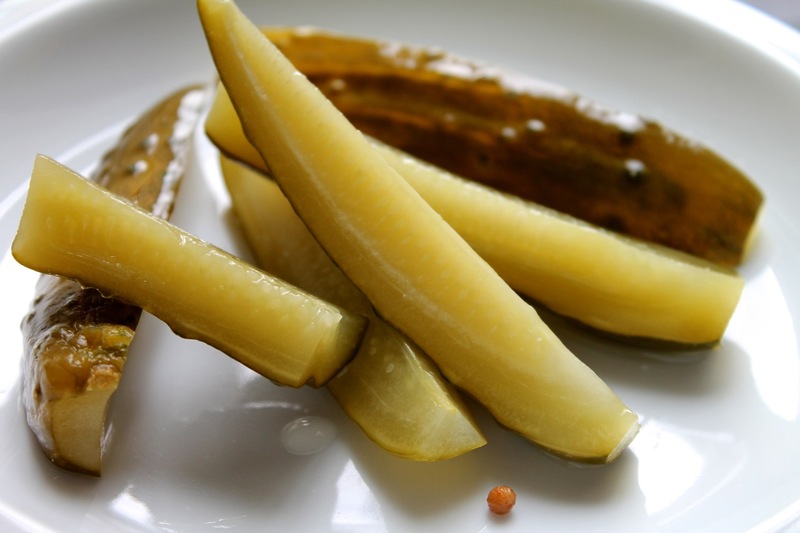 These are "refrigerator pickles"--ones you can make easily and enjoy in the short-term. Since August is National Sandwich Month, I wanted to make a great sandwich that would showcase these delicious pickles. 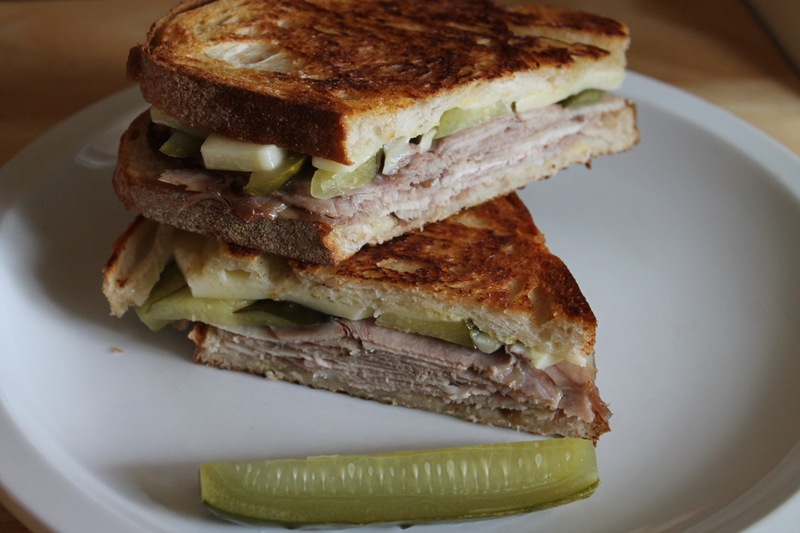 I went with a Cuban, a classic sandwich of ham, cheese, pickles and mustard. 1. Bring water and salt to boil in a medium saucepan, stirring until salt is dissolved. Remove from heat and add 1 cup of ice. Stir until the ice has melted and the brine mixture has cooled. 2. Wash cucumbers thoroughly. Cut a little bit off both ends, then cut cucumbers into spears, chunks or a mixture (you can also leave them whole). 3. 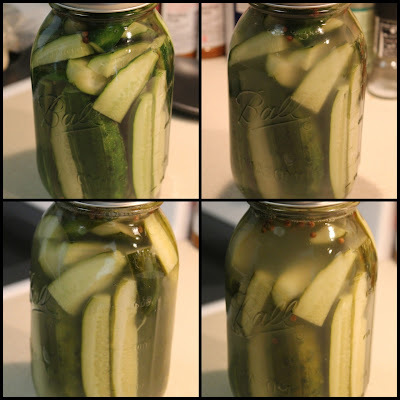 Pack cucumbers into a clean quart jar. Add dill and coriander seeds. Pour the cooled brine into the jar. Put a lid loosely on the jar and place it in a bowl (since the jar may leak a bit during the fermentation--mine did). Leave the jar out on the counter for 3 to 5 days (taste the pickles after the third day and leave out longer depending on how sour you want them). After desired sourness is reached, refrigerate pickles. They will keep refrigerated for up to 30 days. Nobody likes bad news, and it's no fun being the bearer of it. The vast majority of my criticism of restaurants has been very positive. I want to share with you the good things I've discovered so that you may enjoy them too, and we can trade notes about our favorite dishes. I wrestled with whether to write this review, but in the end, I decided I should. A wise critic--Tim Gunn of Project Runway--discussed in his memoir that when critiquing the work of the show's contestants, he focuses on giving only actionable feedback. Once dress construction is under way, suggesting ways the tailoring or embellishment could be adjusted to make the look more appealing is helpful. Telling the contestant that their fabric choices are all wrong is not (they aren't allowed a return trip to the fabric store). Thus, despite being "negative," thoughtful criticism can and should be a "positive." Not a slam, but an invitation to improve. It's in that vein that I'm sharing my views on Becco, an Italian restaurant in New York's Theater District that I had high hopes would deliver a wonderful pre-theater dinner but was ultimately disappointing. The restaurant is owned by Lidia Bastianich and her son Joe. The Bastianiches are not small-time restauranteurs: Lidia is a well-known cookbook writer and Emmy Award-winning television food personality; Joe is a James Beard-award winning restauranteur and best-selling food writer. Together, along with Mario Batali, they are co-owners of Del Posto, one of New York City's five four-star restaurants; Eataly, the fabulous Italian market off Madison Square Park and a favorite lunch spot; and Lupa, a cozy Italian restaurant in Greenwich Village that I absolutely adore. By all counts, these are people who know a lot about food and restaurants. I had high hopes Becco would deliver an experience of a similar caliber to what I've enjoyed in their other establishments. But that didn't happen. While there was nothing egregious about the food or service at Becco, there was nothing special about it either. The food ranged from "not bad" to "pretty bland," with nothing that would make us want to go back for more. With so many competitors placing an emphasis on creativity, quality and freshness, I was surprised to find these lacking at Becco. The meal opened with Caesar salad, a dish historically tainted with excess dressing and forgettable ingredients but that has shown signs of renaissance lately, as chefs turn out incredible Caesars brightened with citrus, quality anchovies, good cheese and a light hand with the dressing (Palena or Graffiato in Washington, D.C., for example). Unfortunately, this Caesar does not aspire to greatness. The lettuce was limp and didn't appear particularly fresh, as it was a bit brown around the edges in places. There was way too much dressing of the gloppy, creamy variety. 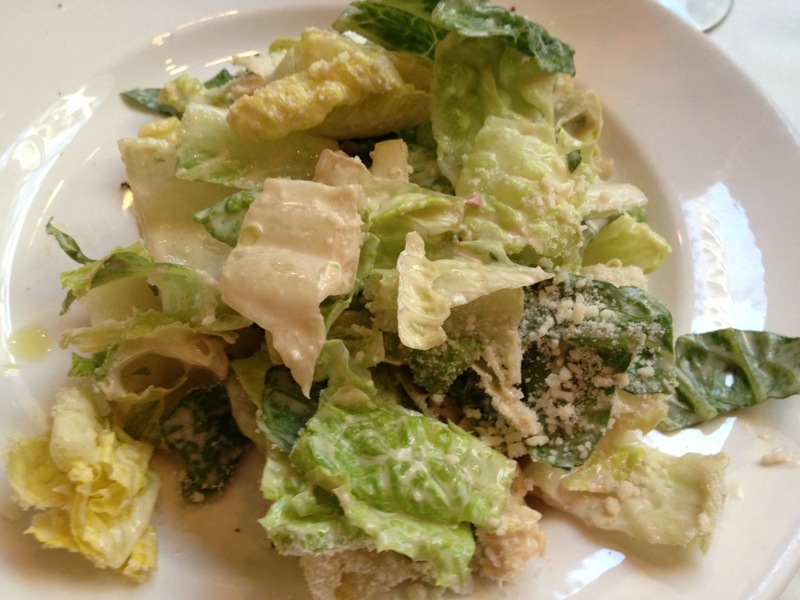 There were two other salads on the menu--including a decent-sounding one with asparagus, fava beans and peas--but with the Caesar already provided (in generous portion) with every entree, I don't see why anyone would ever need to order a second salad. 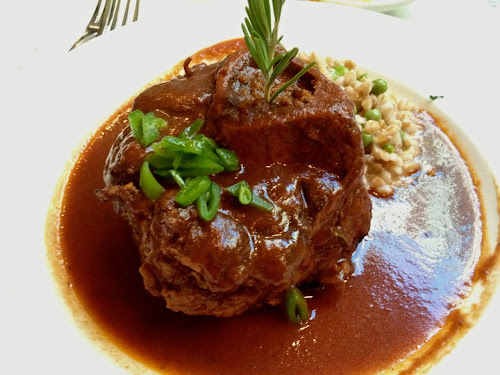 I enjoyed my entree, an Osso Buco (braised veal shank, pictured at top) billed as the restaurant's signature dish. The meat was tender and flavorful and the meaty bone marrow, which you get a little tiny fork to eat with, is redolent of fresh rosemary. Chris's entree, an evening special of braised shortrib with sweet potatoes and kale wasn't terrible, but it was also lacking in flavor. The meat, which was the best part, was fairly tender, but lacked seasoning. The sides, however, were seriously lacking in flavor. My dish's farro side came with peas devoid of flavor and drained of their bright green color (after having marvelous pea dishes at Blue Hill the previous night, it was quite a contrast to eat peas that had almost no taste). Chris's kale side was also pretty bland, as if it had not been seasoned at all. 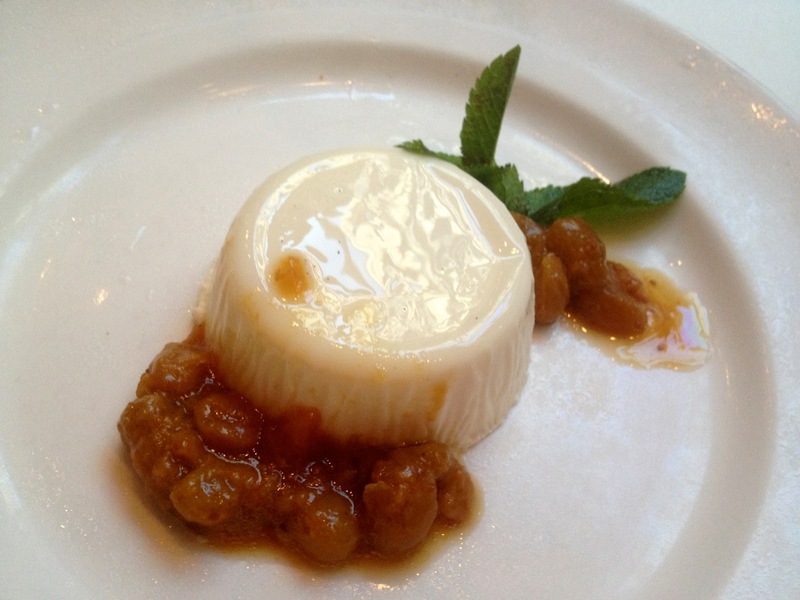 The Panna Cotta dessert was also disappointing. The Italian custard should be creamy and just barely set. This one was pretty solid and not particularly flavorful. Once we'd polished off the macerated golden raisins, the remaining rubbery custard wasn't very interesting. We didn't try the Sinfonia di Paste (a trio of all-you-can-eat pastas), which is prominently featured in a box at the top of the menu, but we saw plenty of it going around the dining room to know we probably made the right decision. The evening's features were a spaghetti with tomato sauce, a penne with broccoli and parsley and a seafood risotto. There's a beautiful pasta dish on the front of Becco's website; none of those three offerings looked anywhere near as appetizing as that. On the plus side, Becco has a voluminous selection of wines, including a very long list (like probably 100 or wines) offered at just $25 a bottle, which is a great deal for wine at a restaurant. We enjoyed a delightful Sicilian Syrah, but could have easily been tempted by a Barbera D’Asti or Nero d'Avola. Becco's space is also charming (albeit cramped) and the location is prime: it's part of Broadway's "Restaurant Row" on West 46th Street. However, that location may be part of the problem. That I know the Bastianiches are capable of delivering restaurant excellence but haven't at Becco is particularly vexing. They have the know-how to make Becco a top-notch place that theatergoers would clamor to get into before a show. I'd love to see them bring this place up to par with their other very good offerings. Becco, 355 West 46th Street (between 8th and 9th Avenues), New York, N.Y. (Theater District). (212) 397-7597. Reservations: Open Table. Lately, I've become kind of obsessed with roasted tomatoes. Most Sunday afternoons for the last month I've had the oven on for hours, slowly roasting 3 or 4 lbs. of beautiful ripe summer tomatoes until they develop deep umami flavors. That's not being pretentious: tomatoes are high in glutamates, a principal source of umami, and roasting tomatoes brings that flavor out even more. This recipe is very close to the Creamy Andalusian Gazpacho I wrote about last year, except that I've substituted roasted tomatoes for fresh ones and also simplified it a bit by removing the step of salting the vegetables and reserving a few diced vegetables to add in the end. This is a smoother gazpacho with an even richer tomato flavor. It goes great with a simple green salad. The broth for this comes from the Roasted Tomato Risotto I wrote about Wednesday. That recipe produced a lot more broth than I needed for the risotto, so I used some to make this dish. The recipe for the broth below is the same as for the risotto, except that I didn't indicate reserving any of the roasted tomatoes. Certainly, if you're going to make this recipe without first making the risotto, I'd recommend roasting all the tomatoes at once in two roasting pans. 1. Preheat oven to 350 F. Toss cut tomatoes with 2 tbsp. of olive oil and a sprinkle of salt. Roast for 3 hours, stirring at each hour mark. Let tomatoes cool and store in the refrigerator until ready to use (be sure to keep the tomatoes and any juices in the pan). This makes about 1 cup of roasted tomatoes. Set aside to cool until ready to use. 2. Preheat oven broiler. Spread red pepper on a baking sheet, spray or brush with olive oil and broil for 4 minutes flesh side up, flip and broil 2 minutes more. Set aside to cool, then dice. 3. Roughly chop the roasted tomatoes, cucumber, onion and the garlic. Transfer the diced vegetables and bread cubes to the blender with the other 1/2 cup of broth, sherry vinegar and basil leaves. Blend on medium speed for about 30 seconds. With the machine still running, through the opening at the top, slowly drizzle in the 1/2 cup of olive oil. Add additional tomato broth, as necessary, to reach a desired consistency (it shouldn't be too thick, but nor should it be runny either). Season with freshly ground black pepper. 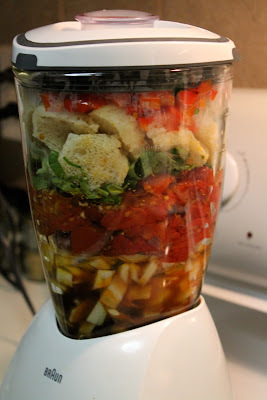 (Note: If you're blender isn't high capacity, you may want to make this in two batches and then mix them together.) Serve soup in bowls garnished with basil leaves. Salt, to taste, plus 2 tsp. 1. Preheat oven to 350 F. Toss cut tomatoes with 2 tbsp. of olive oil and a sprinkle of salt. Roast for 3 hours, stirring at each hour mark. Let tomatoes cool and store in the refrigerator until ready to use (be sure to keep the tomatoes and any juices in the pan). This makes about 1 to 1 1/2 cup of roasted tomatoes. 2. Add roasted tomatoes to a Dutch oven or other large pot along with the fennel, sweet onion, garlic cloves, summer savory, 2 tsp. salt, freshly ground black pepper to taste, and 10 cups of water. Bring to a boil, then cover and reduce heat to simmer for about 2 hours. Strain the mixture with a metal sieve, using a wooden spoon to squeeze moisture out of the vegetables (especially the tomatoes). This should yield about 8 to 9 cups of broth. Store in the refrigerator until ready to use. (Note: this is a lot more than you'll need for the gazpacho--use the rest to make Roasted Tomato Risotto). Roasting tomatoes is one of my favorite ways to bring out the summer staple's deep flavors. 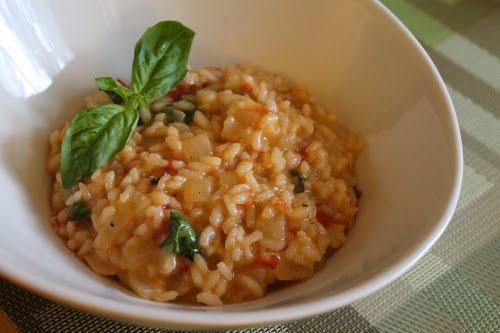 I thought they might make an interesting risotto, but recipes I found online tend to be just a regular chicken stock risotto with some roasted tomatoes stirred in at the end. I wanted my risotto to have bolder tomato flavor. Roasting summer tomatoes brings out their depth of flavor, perfect for making a rich vegetable broth. Inspired by the Washington Post’s recent article on DIY vegetable broths, I decided to make roasted tomato broth and use that as the liquid for my risotto. The resulting dish was a rich and creamy risotto—without the need for cream or butter—with a delicious tomato flavor. In addition to roasted tomatoes, I used fennel, onion, garlic and herbs to flavor my vegetable broth. 1. 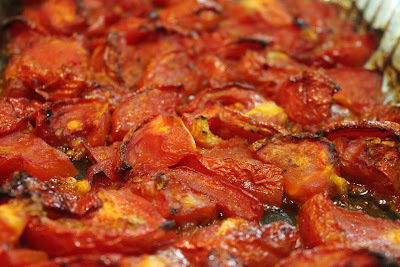 Preheat oven to 350 F. Toss cut tomatoes with 2 tbsp. of olive oil and a sprinkle of salt. Roast for 3 hours, stirring at each hour mark. Let tomatoes cool and store in the refrigerator until ready to use (be sure to keep the tomatoes and any juices in the pan). 2. Chop ½ cup of the roasted tomatoes (about ¼ of the total) and set aside. Add the remaining roasted tomatoes to a Dutch oven or other large pot along with the fennel, 1 roughly chopped sweet onion, garlic cloves, summer savory, 2 tsp. salt, freshly ground black pepper to taste, and 10 cups of water. Bring to a boil, then cover and reduce heat to simmer for about 2 hours. Strain the mixture with a metal sieve, using a wooden spoon to squeeze moisture out of the vegetables (especially the tomatoes). This should yield about 8 to 9 cups of broth. Store in the refrigerator until ready to use. (note: This is twice as much as you’ll likely need for the risotto). 3. Heat tomato-vegetable broth in a medium saucepan and keep warm over low heat (do not boil it). 4. Heat 2 tbsp. olive oil in a Dutch oven over medium heat. Add diced onion and sauté until softened but not browned, about 10 minutes. Add rice, stir to combine and continue cooking another 5 minutes to lightly toast the rice. Add wine and stir frequently until the wine is absorbed. Add 2 cups of broth and cook, stirring frequently, until the broth is absorbed (broth is absorbed when mixture doesn’t immediately cover bottom of pan when you scrape the spoon against the bottom). Add 2 more cups of broth in ½ cup increments, stirring frequently and waiting to add the next ½ cup until the previous one is absorbed. At this point, the rice should have expanded a bit but is still al dente. Stir in the reserved ½ cup chopped roasted tomatoes, parmigiano-reggiano cheese and torn basil leaves. Season to taste with salt and pepper and serve in shallow bowls. Washington Post: “What makes a hamburger and other cooked meat so enticing to humans?,” by Marta Zaraska. Following last week’s story about the lab-grown ground beef, Zaraska dives deeper into the subject of how that meat tasted and what, in general, makes the taste of meat so appealing. 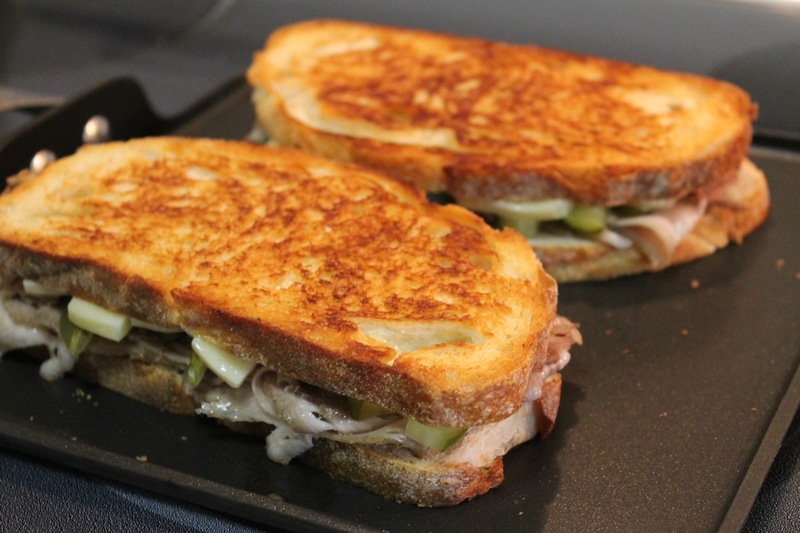 It’s a good discussion of animal fats, the Maillard reaction and umami. Great fun for food geeks like me. 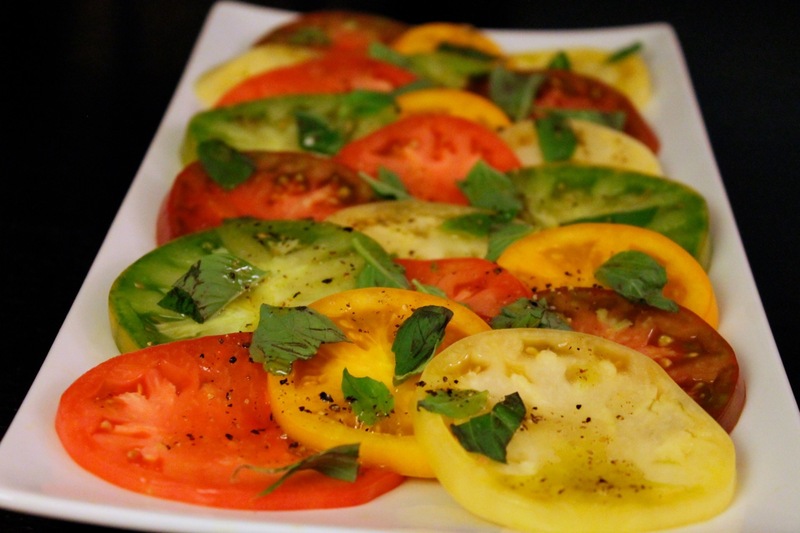 Washington Post: “Top Tomato 2013: So good we added more,” by Bonnie S. Benwick. The Post Food section announced the results of its annual tomato recipe contest with the top three choices being a frozen fattoush, tomato ramen and tomato preserves, plus 13 other honorable mentions. There’s also a nice story from Tim Carman on San Marzano tomatoes, the Italian canned favorite I often turn to myself when tomatoes aren’t in season. North Korea is so isolated that the rest of the world knows little about it. Lately, there have been a few windows opening into that world, like Adam Johnson’s masterful Pulitzer Prize-winning novel The Orphan Master’s Son and several firsthand accounts from other recent westerners allowed to visit under strictly controlled conditions. Larson offers just such an account, which, since it’s Lucky Peach, has a particular focus on the food, or rather the lack thereof, since North Korea doesn’t produce enough food to feed its people and imports half of what it has from China. Lucky Peach is a quirky, sometimes silly publication, but this is a pretty serious story about what it’s like to visit such an odd place. Food & Wine: “Taste vs. Price: How to Find Wine Value,” by Ray Isle. Wine buying has to be one the most challenging of food procurements. It's easy to stick with something you know and love, but venturing beyond that can be very tricky, especially if you're looking to buy at a higher price point. Isle's article is one of the best I've ever read on the subject of wine value: balancing taste and price. He discusses buying in three prices ranges--$10, $20 and $80--and offers good tips on what is currently under- and over-valued. Cabernet from Napa, for example, will carry a premium just for its name, while California cabs from Lake County (an area just north of Napa Valley) and any wines labeled "organic" tend to sell at lower prices, regardless of quality. New York Times: “Recipe Lab: Getting Started With Blueberry Jam,” by Julia Moskin. With blueberries so abundant right now, in this week’s Recipe Lab, Moskin offers a recipe for turning the brilliant blue berries into a jam. 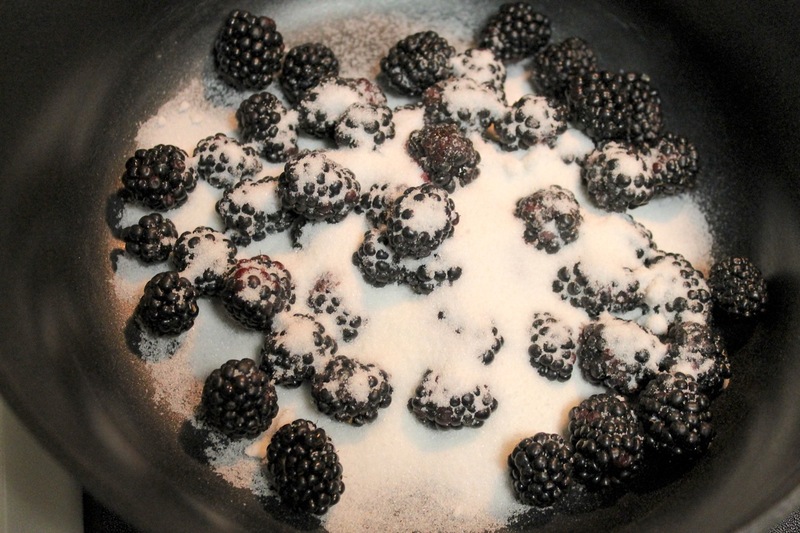 A bit of lime zest helps recover the berries’ tartness that cooks off quickly. Wall Street Journal: “Chefs Rediscover the Beauty of Luscious, Old-School Buttermilk,” by Sarah Karnasiewicz. Have you made your reservation for Alma in Los Angeles? Better do it quick: Bon Appetit just named the downtown spot the best new restaurant in America this year. (I checked Open Table: better plan for 4 weeks out unless you want a really early or late reservation on a weekend.) The modern menu sounds quite interesting (how about smoked white bass with peach, avocado and okra?). Also on the list: San Francisco's Saison (#2), Portland's Ava Gene's (#4), and Brooklyn's Aska (#10), although sadly nothing from D.C. made the cut (Daikaya and Table were among the 50 nominees the top 10 were selected from). The Daily Beast: “Ramen Burger’s Inventor Talks About the Food Craze Eclipsing the Cronut,” by Marlow Stern. Move over cronut; here comes the ramen burger. Seriously. Keizo Shimamoto, an enterprising ramen blogger and chef, unveiled his creation in Brooklyn recently: a beef patty with shoyu sauce, arugula and scallions sandwiched between two ramen “buns.” It actually sounds pretty interesting and doesn’t look half bad. Smithsonian Magazine: “This Is What Happens to a Pineapple Over Two Months,” by Rose Eveleth. This Smithsonian blog post is a short time-lapse video of a pineapple decomposing over the course of 2 months. Then at the end, the video reverses and it “revives.” It’s rather captivating. 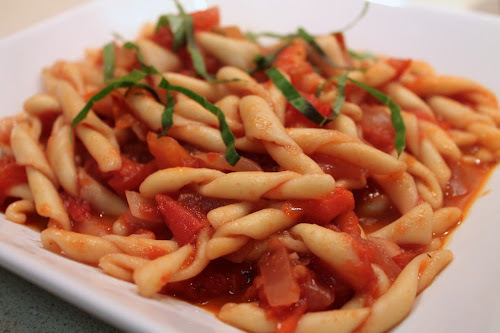 During most of the year, when I want to make tomato sauce for pasta, I have to settle for canned tomatoes, usually Muir Glen, which I find are pretty tasty (especially the fire-roasted variety). In August though, I get to make tomato sauce from fresh tomatoes, which gives the sauce a vibrant flavor you just can't capture in a can. My neighborhood farmers market, New Morning Farm at the Sheridan School, has a mouth-watering array of tomatoes this time of year: golden grape tomatoes that are sweet as candy, heirloom tomatoes in every color and the large red tomatoes I use for this recipe. I boiled the sauce vigorously to quickly reduce and concentrate its flavors. A couple notes on this recipe: it's designed to be something you could make on a weeknight, with a total cooking time under an hour. If you wanted to, you could certainly simmer the tomato sauce over a long afternoon rather than boil it to reduce the liquid faster. You'll develop more flavor that way, although these tomatoes are so flavorful that they manage to make a beautiful sauce even when cooked quickly. 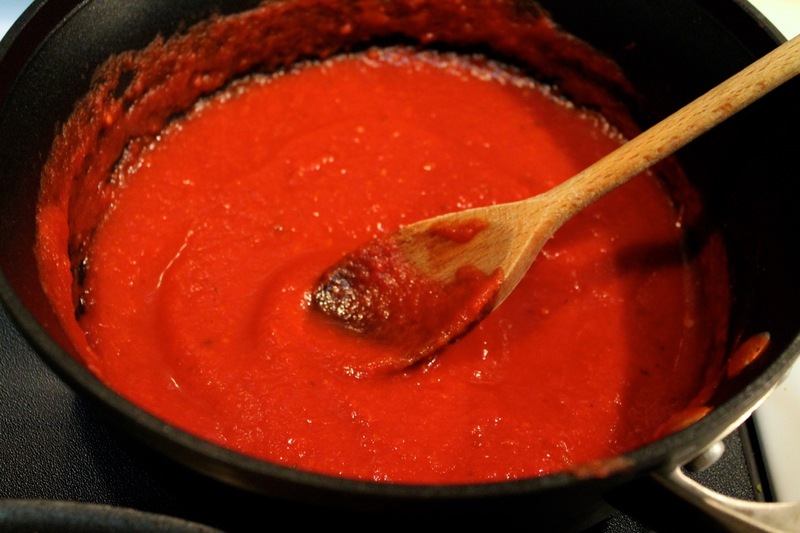 Also, depending on what kind of tomatoes you use, you may not need to cook the sauce as long to reduce it. Roma or plum tomatoes, for example, have less water than the large red variety I used. And if you seed the tomatoes by squeezing out the seeds and the juice around them, you will also have less liquid to reduce, although I happen to think you lose some good flavor by doing that, so I generally don't juice and seed my tomatoes. Stop boiling the noodles a few minutes shy of the recommended cooking time and finish cooking them in the sauce. Finally, let's talk about the pasta. 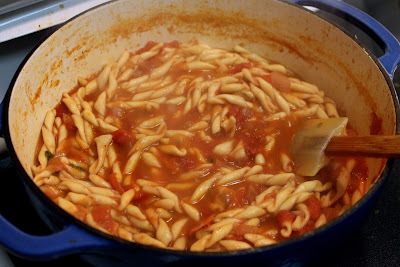 Those beautiful wide spirals are strozzapreti that I bought at Eataly. I tried something new with cooking the noodles that I've read is a good Italian technique: stop cooking the noodles a few minutes shy of the package direction for al dente (I stopped mine at the 11-minute mark instead of going to 14). Then, add the almost cooked noodles to the sauce and finish them as the sauce cooks for its final few minutes. It worked great. The noodles were perfectly al dente and picked up more of the flavor of the sauce. 1. Heat olive oil in a Dutch oven over medium heat. Add onion and sauté until softened, about 6 minutes. Add garlic and sauté another couple minutes. Season with salt and pepper. Add tomatoes and thyme, stirring to combine. Increase heat to medium-high to bring to boil. Add wine and nutmeg. Cook at medium-high until the mixture reduces by about half, about 15 to 20 minutes, stirring occasionally. Reduce heat to simmer. 2. Meanwhile, bring a large pot of salted water to boil. Cook pasta 3 minutes less than package directions for al dente (the strozzapreti I used was supposed to cook for 14 minutes, but I stopped after 11). Drain pasta and add to tomato sauce. Stir to combine and cook for another 2 minutes. Stir in about half of the basil ribbons. 3. Serve pasta in shallow bowls topped with more fresh basil and grated Parmigiano-Reggiano cheese at the table. When fresh summer tomatoes hit their peak about this time of year, they really need very little attention to shine. Buy them locally, keep them on the counter and eat them quickly--they don't last long and, while they do keep fine in the refrigerator, they lose some of their flavor when chilled. 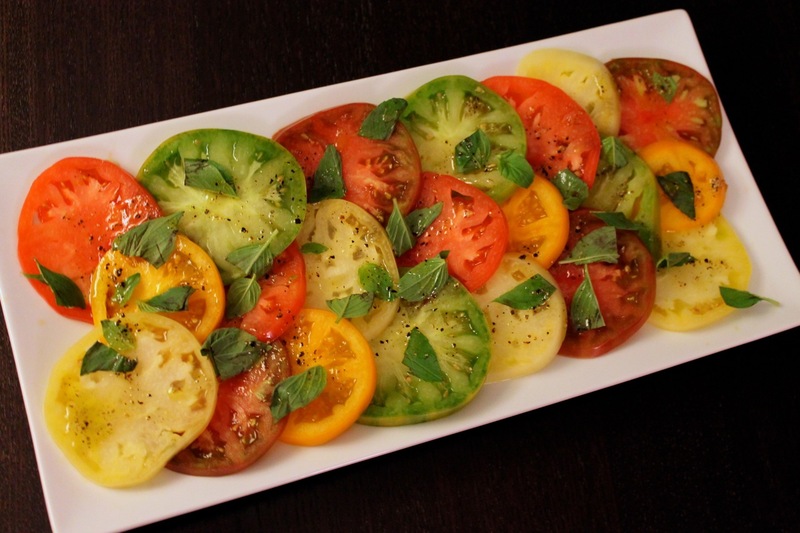 This fresh tomato salad is very very simple. Just sliced tomatoes with basil and a basic lemon dressing. The complex flavor compounds of ripe tomatoes do the rest. Arrange tomato slices on a platter. Whisk together olive oil and lemon juice and pour over tomatoes. 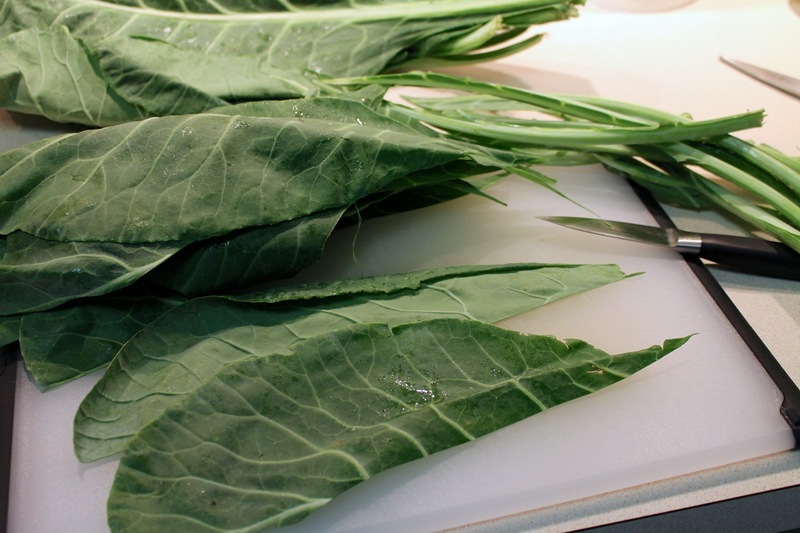 Sprinkle with salt and pepper and top with torn basil leaves. I was so enamored by the flavor of the reduced corn juice used in the Sweet Corn Agnolotti that I thought it would be delicious to use in making ice cream too. Apparently I'm not the only one who thinks corn ice cream is worth a try: Melissa Clark wrote about it in the New York Times last week. My technique is a little different than hers in that I extracted the corn juice and discarded the corn "pulp" rather than steeping the cream in it. I did also use the cobs though, so don't think this makes it any less "corny." Since I've been using the Jeni Britton Bauer method of ice-cream-making a lot lately, I decided to go the more traditional egg custard route with this recipe. This ice cream has intense corn flavor and just the right level of sweetness. I imagine any simple berry topping would be good on this. 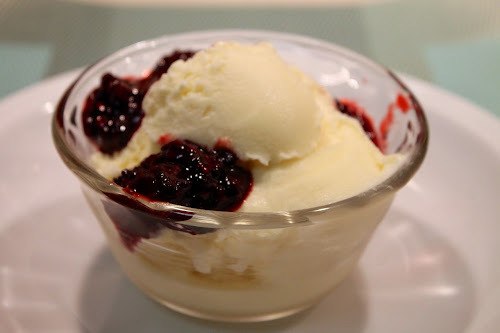 I decided to go with blackberries this time, but was awfully tempted by the blueberries (I'm saving them for panna cotta, which I hope to share with you soon). 1. Cut the kernels off the cobs and reserve the cobs. Scrape the cobs with the back of the knife to extract any remaining bits of corn and juice. 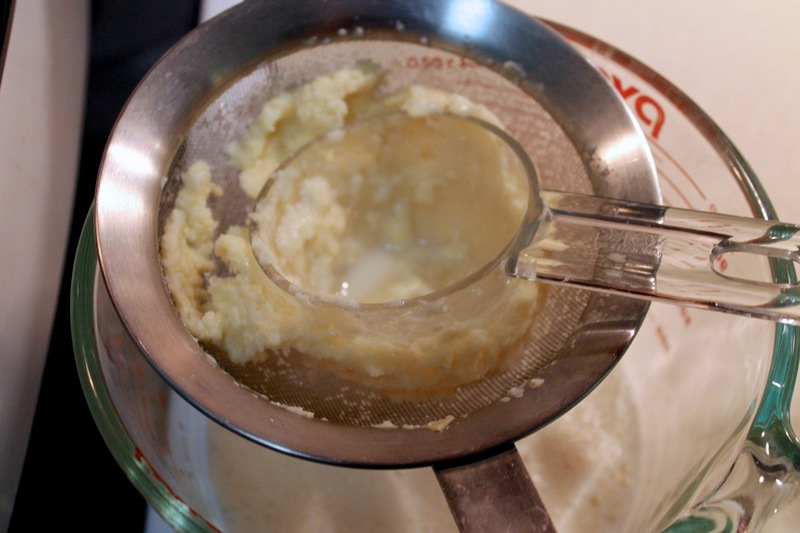 Transfer kernels and scrapings to a food processor (fitted with the standard blade) and process for 1 1/2 minutes until pureed and smooth. Scrape down the sides of the bowl and process another 20 seconds or so to incorporate. Discard the cobs or keep them for another use (like making corn stock). 2. Place a fine-mesh sieve over a mixing bowl and strain the corn mixture, pressing on the solids to push through as much juice as possible (I did this in batches of about 1/3 cup, using the measuring cup to push on the solids, which worked really well). This should make about 1 1/2 cups of corn juice. 3. 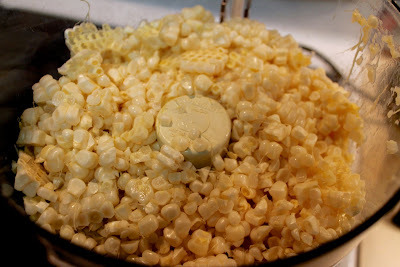 Transfer corn juice to a large (4 qt.) 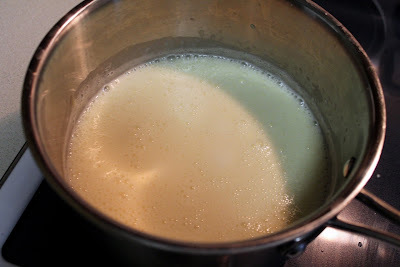 saucepan and cook over medium heat for about 5 minutes, stirring frequently, until the juice reduces to about 1 cup. 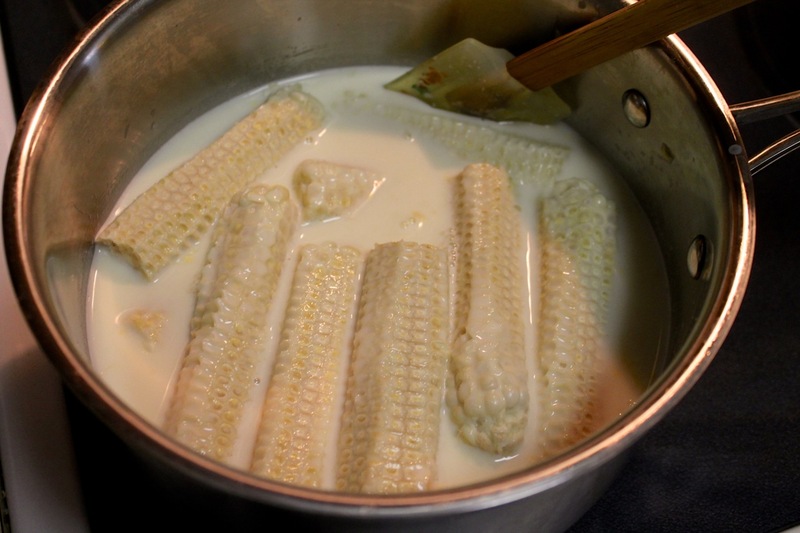 Add heavy cream, whole milk, sugar, salt and reserved corn cobs. Increase heat to medium-high and cook until the mixture reaches a temperature of 165 F. Reduce heat to low and simmer for 15 minutes. Remove and discard corn cobs. 4. 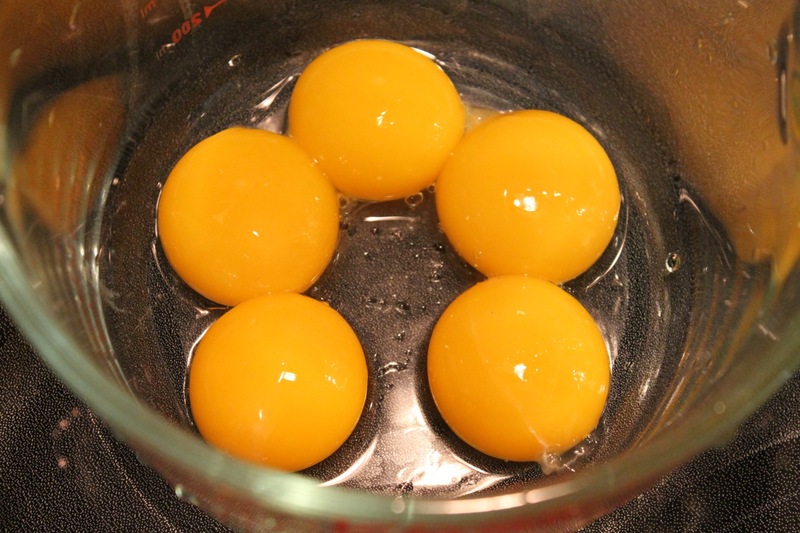 In a small bowl, whisk together egg yolks. Whisk in about 1/2 cup of the warm cream mixture to temper the eggs, then whisk the egg mixture into the warm mixture in the saucepan. Continue cooking, whisking constantly, until the mixture reaches 180 F. Strain mixture with a fine mesh sieve and transfer to a large (1 gallon) resealable bag. Submerge in an ice water bath for about 10 minutes then chill in the refrigerator until cold. 5. 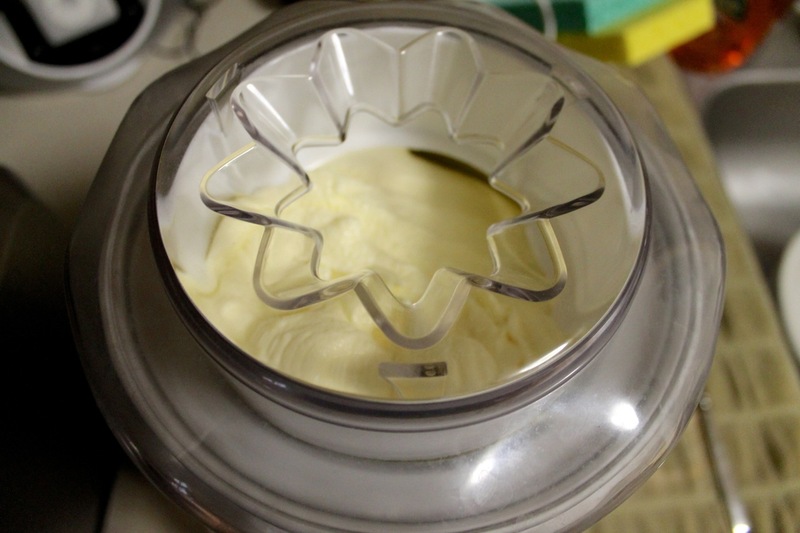 Process in an ice cream maker according to the manufacturer's directions. Transfer to a container and freeze until hard. Set out a few minutes to soften a bit before serving. 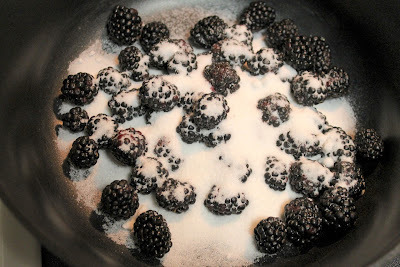 Combine berries and sugar in a medium saucepan over medium heat. Cook, stirring frequently until the mixture boils, reduces and thickens, about 5-7 minutes. Stir in the water. Allow to cool and, if desired, strain out the seeds with a mesh sieve. Transfer sauce to a container to store in the refrigerator. 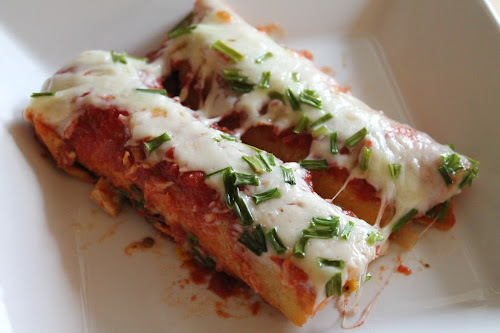 When it comes to my favorite Mexican comfort food, chicken enchiladas have to be at or near the top of the list. Anything with layers of meat, vegetables, cheese and tortillas that's baked in the oven until it's all warm and a bit gooey can't be a bad thing. In some ways, it's a lot like lasagna (which hadn't dawned on me until a coworker saw me reheating some of these as leftovers and asked if that's what it was). 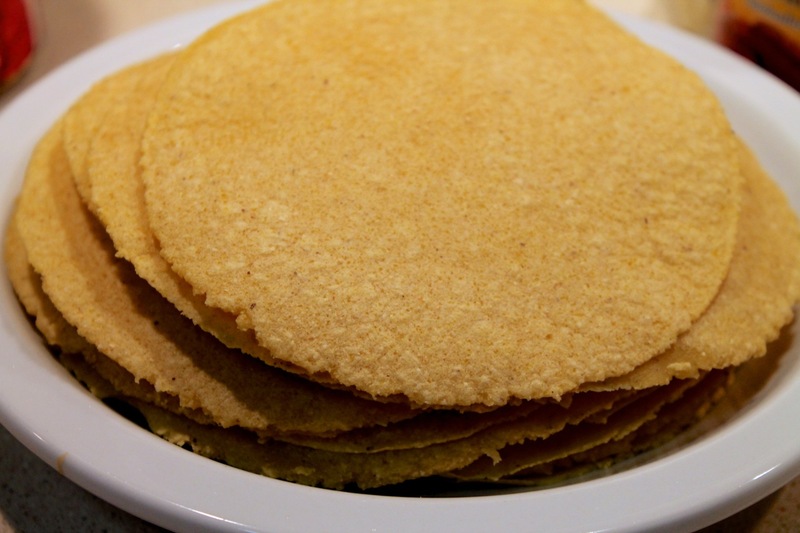 Homemade corn tortillas add a special touch (and they're really easy, seriously). Spicy tomato sauce made with San Marzano crushed tomatoes. 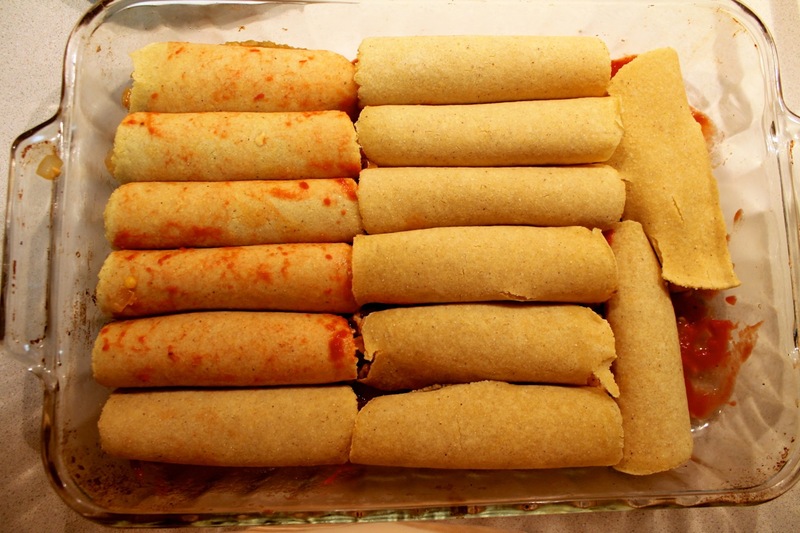 There are many variations of enchiladas. 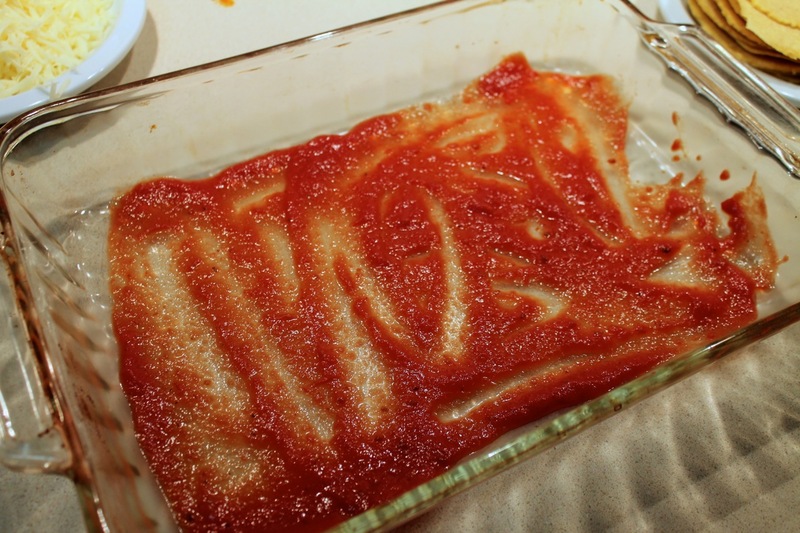 This version might technically be considered an entomatada rather than an enchilada, since it's made with a tomato sauce. 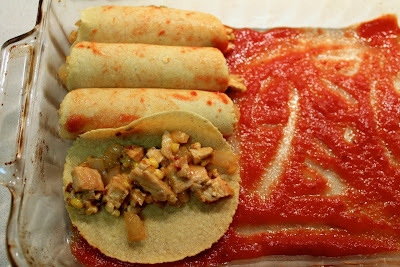 Traditional red enchilada sauce--chile colorado--gets its red color from red chilis. However, there are lots of recipes for tomato-based red enchilada sauce kicking around out there, so I'm sticking with the name since it's more familiar. Roast the corn until the kernels are fragrant and some are browned. The corn and chicken enchilada filling is a bit moist from the béchamel, but not excessively so. For this version, I wanted a satisfying filling that was neither dry nor overly rich. I knew I wanted roasted corn and chicken, but what else? Some recipes don't include any kind of binding to make the filling saucy, but I wanted my enchilada filling to be a bit moist. Other recipes include sour cream, but I didn't want them to be that rich. Seeking a happy medium, I used a little bit of a light béchamel, which achieved just right balance of thickening the filling without making it excessively creamy. 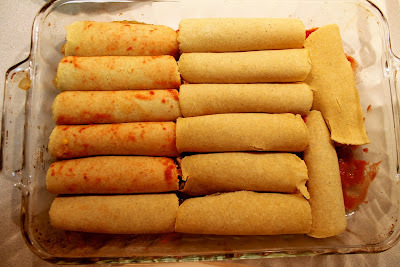 Assemble the enchiladas by first laying down some sauce, then adding the stuffed, rolled tortillas in rows. 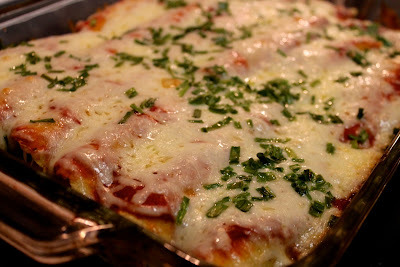 Finish with more sauce, cheese and herbs. I was quite pleased with how this turned out. They're a little spicy but not overly so. If you want them spicier, just use more chipotles in adobe, which impart a wonderful spicy-smoky flavor. 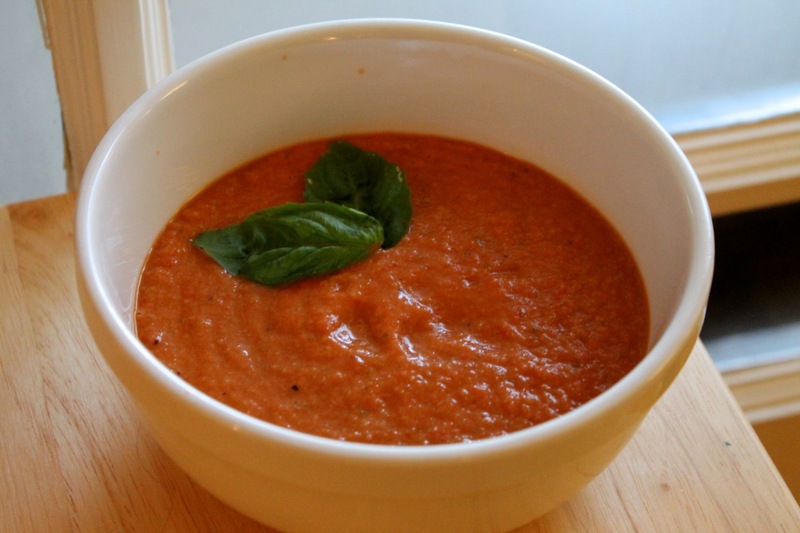 If you can't find San Marzano crushed tomatoes, you could use any type of tomato puree. 1. Preheat oven to 400 F. Shuck the corn and cut the kernels off the cob. 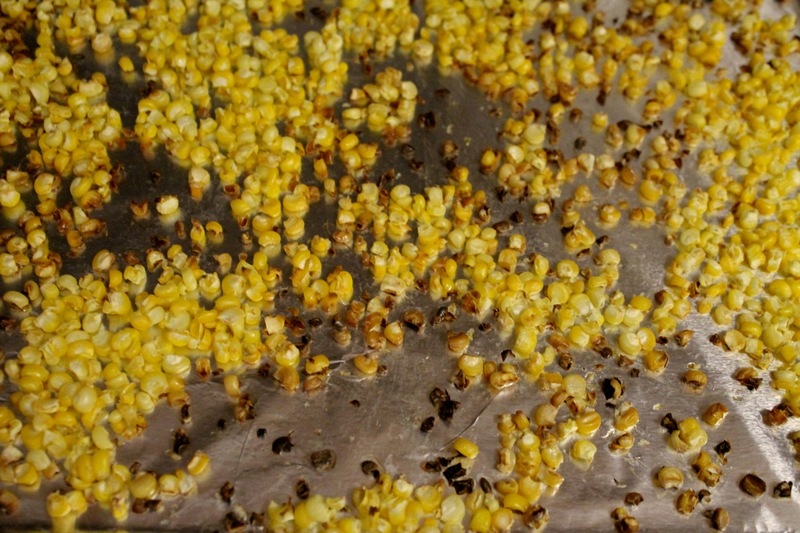 Spray a baking sheet with olive oil and spread the kernels evenly across it. Roast the kernels for 20-25 minutes until they are browned in places and a bit shriveled. Set aside to cool. Reduce oven temperature to 350 F.
2. Heat vegetable oil in a large frying pan over medium heat. Add chicken, season with seasoned salt, 2 tsp. ground cumin, oregano and 1 tsp. garlic powder. Sauté chicken until cooked through, about 10 minutes, turning halfway. 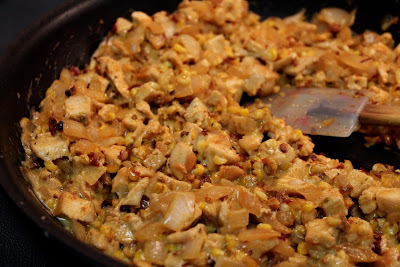 Remove chicken from pan, allow to cool a bit, then chop into small pieces (no larger than 1/2-inch). 3. Add onion to the same frying pan (add a little vegetable oil if the pan is dry), season with seasoned salt and 1 tsp. of ground cumin, and sauté until softened, about 5-7 minutes. Stir in the chopped chipotles in adobe. Remove from pan. 4. Melt butter in the same frying pan. Add flour and whisk to combine. Cook until thickened and lightly brown, whisking continually, for about 2 minutes. Add milk and whisk to combine. Cook until the mixture is thick and bubbly. Stir in about a cup of the shredded cheese until it melts. Turn off the heat and stir in the roasted corn, sautéed chicken and onion mixture. 5. 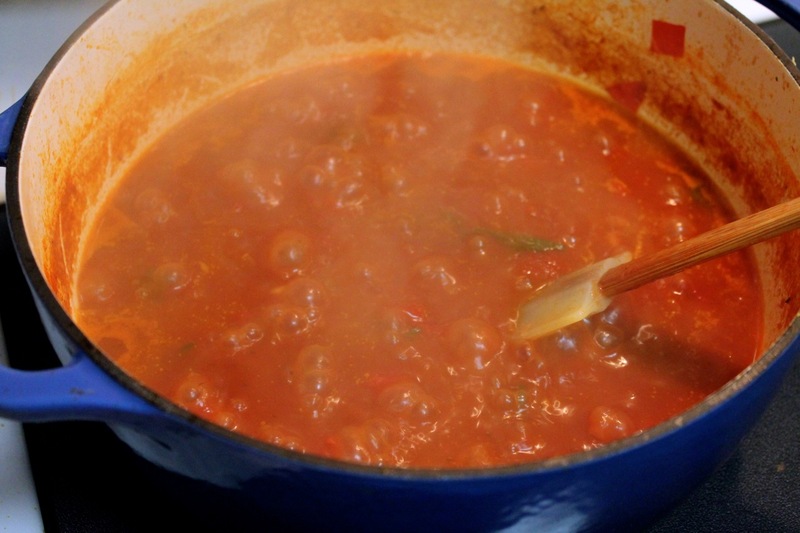 Meanwhile, make the tomato sauce: pour crushed tomatoes into a medium saucepan and heat over medium-low heat. Add remaining 2 tsp. ground cumin, 1 tsp. of garlic powder and 4 tsp. of the adobo sauce from the canned chiles (may add more or less adobo sauce depending on how spicy you want it). Stir ingredients together and cook until the mixture just starts to get a little steamy (you don't want to boil it). Remove from heat. 6. If not using freshly made (and therefore still warm) corn tortillas, warm tortillas in a frying pan or in the microwave wrapped in damp paper towels. 7. 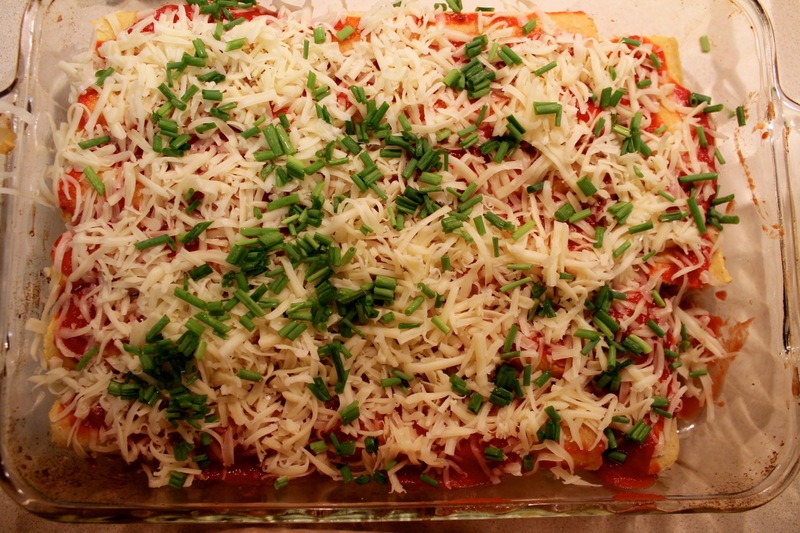 Assemble enchiladas: Set out a 9 X 13 baking dish. Spread about 1/4 cup of the tomato sauce on the bottom of the dish. Take a tortilla and add about 1/4 cup of the chicken mixture (use more if the tortillas are larger--mine were about 5-6 inches diameter). Roll tightly and place seam-down in the baking dish. Repeat, lining the filled tortillas up in rows until the dish is full. Depending on the size of the tortillas, you should be able to get at least 12 in and possibly as many as 15 or 16. Pour the remaining tomato sauce over the top and spread evenly with a spatula. Top with the remaining shredded cheese and sprinkle with fresh herbs. Bake in the oven until the cheese is melted and the tortillas start to brown a bit, about 20-25 minutes. Remove from oven and allow to cool 5-10 minutes before serving.